Stick Label - Stinky Lockers Ltd.
Big League Stick Labels are custom design and printed on 3M Vinyl self adhesive digital print media. Each label is contour cut and laminated for durability. All decals are water and scratch resistant. 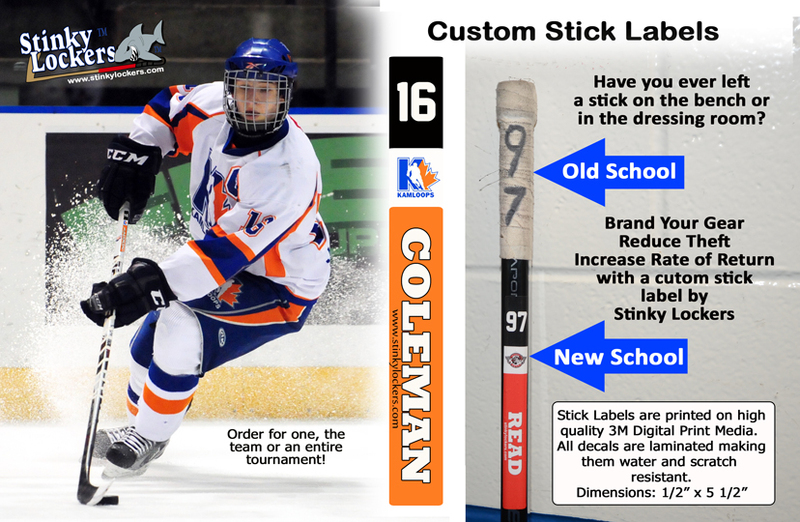 Easy step by step instructions make Big League Stick Labels easy to apply directly onto your own stick. Endorse your own stick and turn your stick into a "Big League Stick!" Order for one, the team or an entire tournament! Ideal for hockey, ringette, lacrosse, curling & more! Have you ever left a stick on the bench or dressing room? Changing a broken stick on the fly has never been so easy. Increase your rate of return with custom stick labels by Stinky Lockers. I have been buying stick labels for my teams for 2 years now (Hockey and Lacrosse) and the kids and parents love them!!! No sticks get left behind.! Thank you Stinky Locker! Great service, fast shipping, and Great Product!!!! Nice product, 2nd time using and was pleased the first time. Nice detail in the logo. Would recommend.